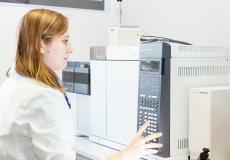 With this term the combination of a particular kind of sample preparation (= pyrolysis, often also additionally by means of thermodesorption through the so called ‘double-shot-technique’), sample separation (GC = gas chromatography) and analysis (MS = mass spectrometry) is associated. It is applied for the characterization of polymer materials and for failure analysis more and more often. 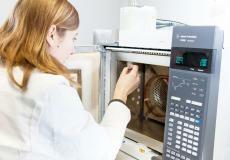 The Pyrolysis GC is an analytical method by means of which almost all sample materials (solid or liquid) can be characterised using minimum sample quantities (30µg to 1 mg) without prior sample preparation. 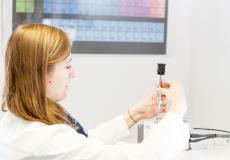 On the one hand it can be used to record initial sample parts in terms of materials with a high resolution and to compare them with serial samples in cases of doubt, during the failure analysis on the other hand valuable evidence can be found for substances which have diffused into failed samples. 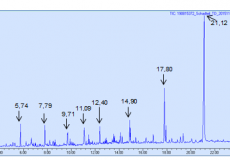 The analysis below shows how the causal agent of a failed EPDM-seal could be determined by a performed GC-MS-analysis, namely a detergent with long-chain organic acids.